Pull your cylinder and have it measured before you order a piston. Most likely it'll need a bore job. Valve seats should be OK , but you'll want to lap the new valves in. Measure your springs and valve guides , change the valve seals. See what your cam and rockers look like too. Along with cam chain and tensioner , make sure to get the pivot shaft for the tensioner. Order an oil pump for an XR650L , they've improved them a little over the years. Your bike looks like a xr 600 with xl turn signals on . I think most parts are the same but maybe check it out . Here is a pic of my 83 xl . I just rebuilt my motor top to bottom it also made some bad noises . The bore was out of round at the bottom and the rod had some play. A rebore and some new parts and she sounds like new. Get a new pump , all years are the same. look for scoring on the rocker pads that contact the cam , same for the cam. I'm gonna have to agree with carpenter, that pic sure looks like an xr, even the frame. Is the frame downtube round or square? XR's are square tube. Also, xl's dont have a remote reservoir on the rear shock. Someone would have had to weld on the mount for that reservoir. Remote reaervoir, u mean the adjuster? this? Yes, the adjuster knob is mounted on the shock reservoir. Notice the part of the frame the reservoir is strapped too? Xl's don't have that piece of frame. Here's an Xl frame for comparison. The part circled in red has no bracket for a reservoir because as you can also see, the stock Xl shock does not have a remote reservoir. Also, the side plastic on an Xl mounts to the frame (circled in black) whereas yours has a zeus(sp) clip set into the air box as it is on XR's. Here is an XR frame for comparison. See how similar it is to yours? Can you snap a better photo of the downtube? 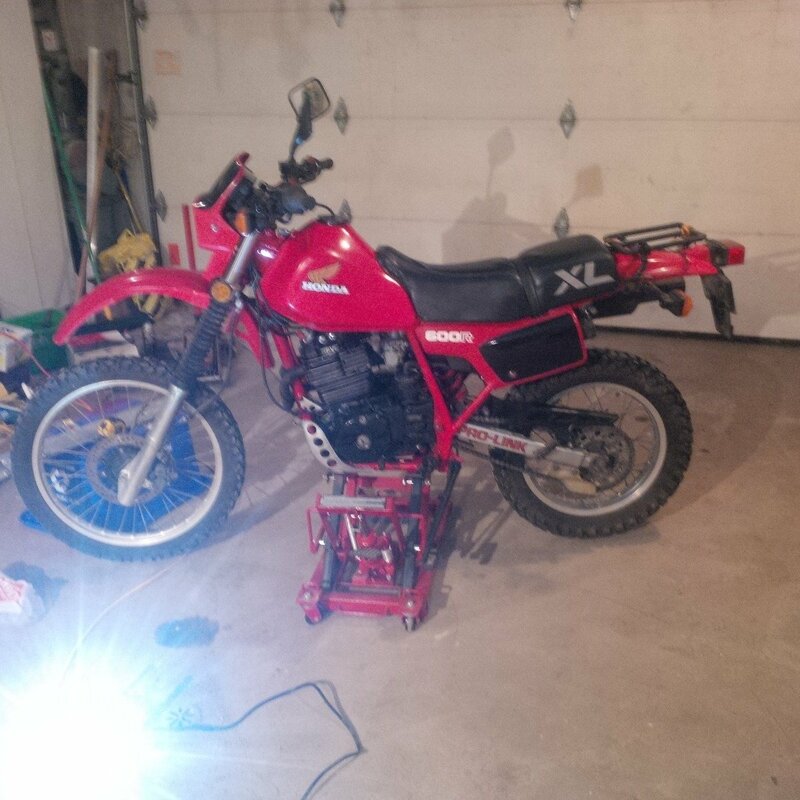 I'm wondering if someone swapped motor and frame tag from an Xl into an xr frame to make the xr street legal. It's got to be an XR500R frame. I sure agree that the tag is from an Xl! Those pics show the head tube, not the downtube. Here's an XL downtube, round. And here's an XR downtube, square. So how would i know for sure if its an xr500r frame? It's the easiest way to street legal an xr! It costs two rivets. Lol! But if the motor # matches the tag then you got the best of both worlds, 30mm ph60a carbs, bigger valves, shorter stroke, street legal, xr everything else!